all the details come from the author's meticulous observation of the real life and his rich creativity. Custom size are welcomed if you want to be more unique. Please contact us for a custom work. Size of this colorful cow paintings: 32x32inch. Gallery wrapped and stretched with wooden frame on the back, ready to hang. Handmade wall art animal paintings on canvas. 100% hand painted by skilled professional artist, use high quality environment protecting oil paints with firm canvas. Waterproof, UV-resistant, color fading-resistant for years. 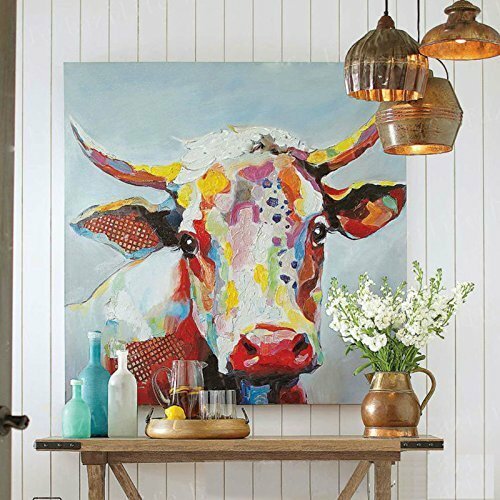 This gorgeous 3D cow wall painting is painted with red, yellow, white, blue and black oil paints, designed with modern thick palette knife oil painting crafts and textured details, makes it a good choice of the home decor paintings. Simple but feels elegant is the main feature of this canvas animal paintings. Textured canvas paintings would be a unique decoration for walls in living room behind the sofa, bedroom, kitchen, office, hotel, dining room, bathroom, bar etc. Also a selected gift for your lover, friends, family, colleagues. What you get: 1x 3D Textured Colorful Cow Oil Painting. Faicai Art provides a 6-month warranty that covers any quality or manufacturing related issues. You can get an exchange or refund if your item has any quality issues within 6 months. If you have any questions about this product by Faicai Art, contact us by completing and submitting the form below. If you are looking for a specif part number, please include it with your message.